STUDENTS LEARN HISTORY OF FARMERS BRANCH! WE HAD SUCH A PERFECT, SUNNY DAY FOR THE FIELD TRIP TO FARMERS BRANCH HISTORICAL PARK ON THURSDAY, MARCH 23RD. If you have never been there, it is like Old City Park in Dallas. There are buildings from the early 1900s connected by brick roads. 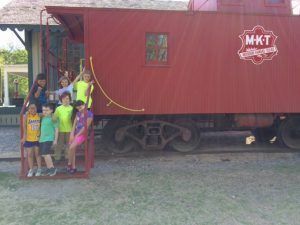 We stepped back in history and explored the old train depot, a caboose, a service station and a general store. Our tour guide, Danielle, was dressed in period costume. The students really enjoyed seeing the train station, learning about the telegraph and exploring inside the caboose. The caboose had bunks for sleeping, storage, and a kitchen area with a wood stove. In the service station, they saw the old gas pump outside. Inside the area was divided up into customer seating and the garage. There was an old truck inside. When we got to the General Store, we sat down and Danielle told us about the building, and how items were arranged in the store. She gave everyone a list of items, and we had a scavenger hunt. The students enjoyed looking at the toys, tools, jewelry and other items. After the tours, we walked through the garden, got our picnic lunches and at lunch in the play area. As students finished lunch, they played hopscotch. When lunch was over, we took a soccer ball and Frisbee and enjoyed the open field. The kids had such a full day, several fell asleep in the van on the way back to school. We would like to go back again and tour the school or one of the old houses. Danielle said the park is open on weekends. One building is usually open with a guide in costume. They rotate which building is open each weekend so that you can see them all over a period of time.